The products on this page have been designed to help you conduct safe and successful bicycle touring adventures anywhere in the world. The Bicycle Touring Blueprint is the world’s most popular, detailed and easy to understand information on bicycle touring anywhere in the world. Learn to conduct the bicycle tour of your dreams with The Bicycle Touring Blueprint. This helpful book teaches you about what makes touring bikes unique, what to look for in a good touring bicycle, and introduces you to more than 100 different touring bike models made by both large and small companies all over the world. 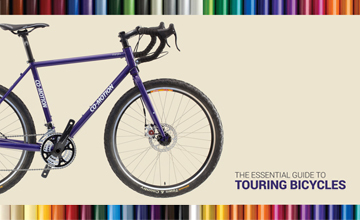 This 14-part video course has been designed to help you learn what a touring bicycle is, determine which type of touring bicycle is going to be best for you, and equip you with the information you need to go out and purchase a touring bicycle of your very own. With this unique how-to video training course, you will learn everything you need to know in order to confidently plan, prepare for and execute your dream bike tour anywhere in the world. 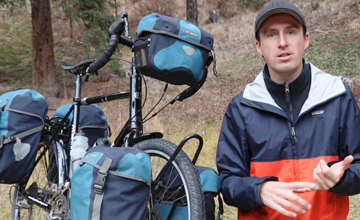 Perfect if you’re new to bike touring and want to get started on the right foot! Buying, cooking and eating delicious foods while traveling the world on a bicycle doesn’t have to be a painful or difficult task. In fact, cooking delicious meals with local foods found along your travels can be both easy and downright enjoyable! 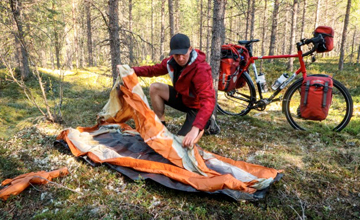 If you are looking for the toughest and most reliable bike touring tents, panniers, bicycle racks, etc… the CycloCamping gear shop is here to help you make the right choices for the best camping equipment and bicycle touring gear for your trip.